Where can I find games, activities, and other cool Astronomy stuff on the web? Where can I find awesome Astronomy pictures/movies? Six hour time lapse showing the Milky Way. What Astronomy stuff is available at the Ann Arbor District Library (AADL) or at the Ann Arbor Public Schools Libraries (AAPSL)? How can my school host an Astronomy event? Tell your teacher about the Young Astronomers website. 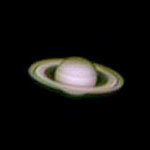 The Photo of Saturn was taken by David Tucker during an open house at Peach Mountain on March 4, 2006. Return to the Young Astronomers Home.